From advancements in innovative fibers/yarns to carbon composites basalt fabrics, and sustainable laser finishing technologies for treating fashion jeans. The combined Techtextile North America, Texprocess Americas, and JEC show showcased these and other new developments targeted toward a broad range of end-use markets. Based on the reactions from attendees and exhibitors in Atlanta on May 3rd through 5th, the 13th edition of this show provided a strong vision of U.S. textile industry. With the diverse array of products exhibited, the show offered an excellent opportunity to see what's new in the development of innovative crossover products and technologies. Several of these advancements were highlighted in the Bonus Seminar Sessions that showcased company partnerships bringing new products to market, such as developed from the collaboration among Chomarat, Auburn University and Highland Industries to commercialize open architecture composite structures. The FabricLink Network reviews this composite, as well as other technical products that grabbed the attention of show-goers. Highland Industries showcased its new Composites Division and the commercialization of a new composite product, initially developed by its partner, Auburn University. David Branscomb, PhD, oversees Highland's research and development of braids and engineered composites. 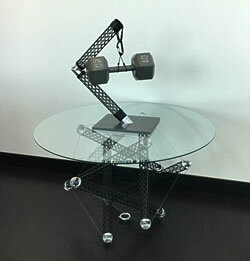 The new open architecture composite truss structure utilizes carbon fiber in standard engineering structural shapes, such as round and square tubes, to optimize a perfect balance between high performance and weight. Highland Composites is commercially marketing its carbon fiber braiding solutions for uses such as spare frames for bicycles and wheels, hiking sticks, sporting goods, hunting and fishing products, light poles, flag poles, patio furniture, etc. Gehring-Tricot Corp. and Tweave, a leading US manufacturer of warp knits, circular knits, and stretch woven fabrics, chose to highlight its recent investment of $3 to $4 million in equipment upgrades to further advance the company’s manufacturing capabilities.Â As a multi–faceted 4th generation textile resource, Gehring operates textile production facilities in New York and Massachusetts, and has been improving its engineered textile products every year for over 60 years. Gehring typically uses 200–250 yarns in different combinations of filament and spun versions to create textile solutions that service a variety of industry needs, including medical, sports, safety, aerospace, apparel and defense. 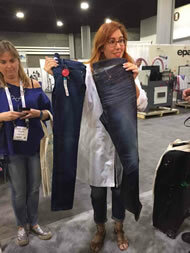 Jeanologia, a Spanish company focusing on the development of sustainable technologies for finished garments, exhibited its new innovation, the Light PP Spray, that guarantees zero pollution in the finishing of denim. The new technology eliminates the use of potassium permanganate spraying, which is a technique that poses a hazard to workers and the environment. Jeanologia is also a pioneer in the development of laser technology that is capable of creating wear patterns, and in the processing of dry denim, avoiding the use of hand sanding or sandblasting, which can both be harmful to workers' health. In addition, the technology reduces the use of water by 90% and chemical energy consumption by 50%. ICF Mercantile, which distributes yarns for the European based, Glanzstoff Industries, showcased the permanently inherent flame-retardant high-tenacity continuous filament viscose yarn, VISCONT® FR, which is specifically designed for applications in the Personal Protective Apparel market. ICF Mercantile promotes VISCONT® FR’s inherent “no melt-no drip” flame-retardancy qualities, which will not dissipate with launderings. The fabric maintains its integrity up to 100 launderings. In addition, the yarn has excellent abrasion resistance, low surface friction, excellent dyeability/printability, excellent pilling resistance, and is biodegradable. VISCONT® FR's low profile is ideal for multi-layer, high abrasion resistant fabrics such as softshell fabrics.Â Multi-layer fabrics can also be constructed, using VISCONT® FR as the face layer, PTFE as the middle layer, and fleece fabric as the bottom layer. The softshell apparel construction also provides excellent comfort, wind-resistant, and water-repellency (DWR finish) qualities. VISCONT® FR Stretch fabrics can also be created using core wrapped yarn, which gives excellent stretch for a multitude of applications. ICF Mercantile also markets other specialty fibers targeted towards the aerospace, industrial, construction, specialty apparel and fire services markets. Olbo & Mehler, focused on three market segments in the US–automobile, industrial and construction, and is a worldwide expert in the development and manufacturing of conveyor belt fabrics and special fabrics for different industrial applications. At Techtextil North America, the company presented some of its most popular products, including fabrics for timing belts, and for handrails. The company's patented treated basalt fabric is being used in heat resistant and fire retardant applications. Basalt fabric is made from extremely fine fibers of volcanic basalt rock. The basalt fabric has better physical force, is stronger than fiberglass, and is significantly more economical than carbon fiber. Olbo & Mehler's textile production technique of RFL–treated basalt allows for applications where operating temperatures are as high as 700°C (1346°F), and at the same time maintains a high resistance to chemicals.